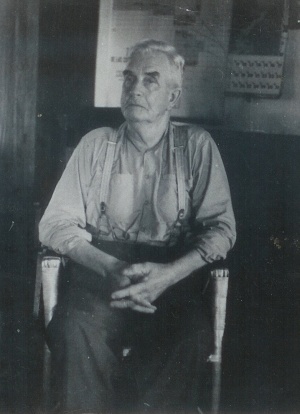 Martin Cornelius Friesen: minister and farmer; born on 6 October 1889 to Cornelius T. Friesen (20 March 1860, Bergthal Mennonite Settlement, South Russia – 21 January 1929) and Katharina Friesen (16 September 1863, Russia – 19 September 1908, Manitoba, Canada) in Osterwick (later renamed New Bothwell), Manitoba, Canada. He was the fifth of 12 children. On 18 July 1911, he married Elizabeth D. Wiebe (11 January 1893, Canada – 5 August 1973, Loma Plata, Menno North, Paraguay), his stepsister from his stepmother’s first marriage, daughter of Heinrich D. Wiebe (23 March 1859, Russia – 3 December 1908, Canada) and Gertrude (Dyck) Wiebe (3 August 1863, Russia – 29 October 1940). The couple had four daughters and three sons. In 1925, Martin was installed as Ältester (bishop) of the Chortitzer Mennonite Church, and in 1927, he moved to Paraguay to lead a new congregation there. He served as bishop until his retirement in 1966, but continued to serve as a minister. On 7 April 1968 Martin attended a communion service and then went to visit his wife who was ill in the hospital in Loma Plata, where he passed away later that day. The son of a prominent church leader, Martin grew up in a family dedicated to serving the church and the poor. Martin received his elementary school education in Osterwick before going on to study theology on his own. In 1909, he was baptized in the Chortitzer Mennonite Church, and in 1911, he married Elizabeth Wiebe. The couple lived with their parents for some years before moving to their own property. Friesen continued to pursue his theological career and was elected as a minister on 15 July 1924 Chortitzer Mennonite Church. A little over a year later, on 8 October 1925, Martin was installed as Ältester (bishop) of the Chortitzer Mennonite Church, succeeding Ältester Johann Dueck. When many Mennonites, concerned about increasing government control over education, chose to immigrate to South America in the 1920s, Martin and his family joined them. He left for Paraguay in 1927, helping to establish what was to become Menno Colony and serving as a leader for the immigrants until his retirement. Altogether, Martin led the church for 44 years, first in Canada and then in Paraguay. He was known as a dedicated leader, caring for the needs of the whole congregation and helping the people through the challenges they faced, such as a delay in getting the land surveyed for new settlement, as well as outbreaks of disease that killed many of them. Over three hundred people decided to return to Canada, but Martin continued to work with those who stayed, eventually helping to resolve the land problems. Friesen also helped the immigrants work out other issues they faced in their new home. He was active in establishing churches and schools, which often used the same building for both purposes, and he also helped the farmers learn to grow crops unknown to them in Canada, such as castor beans and cotton. As a minister, Friesen preached, taught, and held communion services in many churches around the area. He would frequently visit communities such as Gnadenfeld and Weidenfeld, as well as locations further from home. He also participated in conferences held in Filadelfia and elsewhere, held Bible studies, and conducted weddings and baptisms. He instituted a variety of reforms, from changing the standard dress expected of ministers to promoting education as a way to build up the church. Meanwhile, Martin worked as a farmer to support himself and his family, growing fruit and other crops. He and his wife frequently hosted their grandchildren for long visits or went to see them in their homes, and Martin also counseled church members who came to his house to consult him. He continued to be active in the church until the day of his death on 7 April 1968. Martin C. Friesen was a dedicated teacher and minister who used his many skills to help his community. Both in Canada and South America, he worked hard to assist people in need, leading them to a greater understanding of God and the church. Throughout all of the challenges of his life, he remained faithful to his calling and left an example for the entire community to follow. Dyck, John, ed. "Ältester Martin C. Friesen, 1881-1968." Preservings (December 2005): 61-63. Friesen, Martin W. "Martin C. Friesen in Paraguay." Preservings (December 1995): 13-14. Friesen, Martin W, "Und es begab sich… Aus dem Leben und Sterben des Ältesten Martin C. Friesen, Menno." Mennoblatt (1 May 1968): 2-4. Geschichtskomitee der Kolonie Menno. Unter der heißen Sonne des Südens. Loma Plata, Paraguay, 2002. Guenther, Titus F. "Ältester Martin C. Friesen (1889-1968): A Man of Vision for Paraguay’s Mennogemeinde." Journal of Mennonite Studies (2005): 185-211. Ratzlaff, Gerhard. Ein Leib - viele Glieder - Die Mennonitengemeinden in Paraguay. Asunción, Paraguay: Gemeindekomittee (Asociación Evangélica Mennonita del Paraguay), 2001. Reimer, Abram B. "Ältester M. C. Friesens Leben und Arbeit." Mennoblatt (1 May 1968): 4-5. Wiebe, Katherine Friesen. "Bishop Martin C. Friesen 1889-1968." Preservings (December 1995): 12-13. Huebert, Helmut T., Susan Huebert and Richard D. Thiessen. "Friesen, Martin C. (1889-1968)." Global Anabaptist Mennonite Encyclopedia Online. November 2009. Web. 18 Apr 2019. http://gameo.org/index.php?title=Friesen,_Martin_C._(1889-1968)&oldid=91823. Huebert, Helmut T., Susan Huebert and Richard D. Thiessen. (November 2009). Friesen, Martin C. (1889-1968). Global Anabaptist Mennonite Encyclopedia Online. Retrieved 18 April 2019, from http://gameo.org/index.php?title=Friesen,_Martin_C._(1889-1968)&oldid=91823. This page was last modified on 23 August 2013, at 14:01.